Common Beginner Coupon Lingo - What Does That Mean? 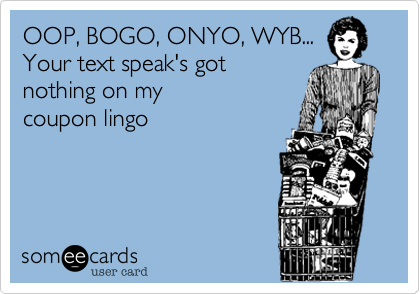 Common Beginner Coupon Lingo – What Does That Mean? $1/2, $1/3 – The dollar amount of the coupon and the specific product amount needed for redemption. Blinkie – Coupon dispensers found in many grocery stores that commonly have a ‘blinking’ light. Bricks – Coupons that have ‘brick’ in the web link. Most can be printed twice per user. Cartwheel – A digital coupon program offered by Target retail stores. Catalina (CAT) – Coupons that are printed during checkout and are valid towards a future purchase. Most are manufacturer coupons but have contain the logo of the issued store. Coupon Fairies – Refers to people who leave coupons near a specific product so that others may redeem them. CRT – Cash Register Tape — Refers to coupons printed on the bottom or back of a store issued receipt. DND – Do Not Double – Coupons with this designation cannot be ‘doubled’ (see below). Double Coupon – Many grocery stores will ‘double’ the value of coupons under $1 in order to attract/retain customers. ECB’s – Extra Care Bucks – CVS based program – these coupons print on receipts. ETS – Excludes Trial Size – Many coupon offers do not include trial sized products. Glitches – Refers to an error that gives added value to a coupon that was not intended by the manufacturer or issuer. In-Ad – Coupons that come in the weekly store ad. Inserts – Coupons ‘bundles’ found in the Sunday Newspaper. Matchups – When coupons are ‘matched up’ with corrisponding items that are on sale at a specific store. Money Makers – Refers to situations when the value of used coupons exceeds the total purchase price of the items. Peelie – Coupons attached to an item’s packaging that can be peeled off and redeemed at checkout. Stacking – Using a manufacturer’s coupon and a store coupon in the same transaction for the same product. Tear pad – A pad of rebate forms or coupons found near a product or at customer service.